Thanks to Lauren of Essex who helped to demonstrate the comparison in size between a Giant Redwood and a 5-year-old! 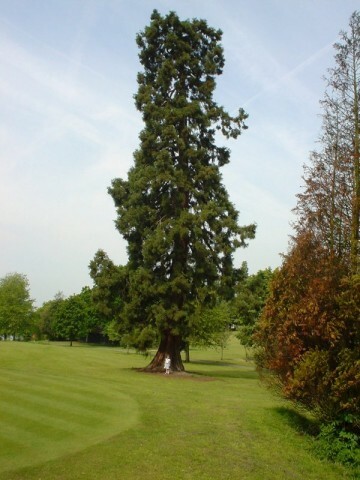 The tree, along with another Wellingtonia and a Dawn Redwood (second picture), is in a very pleasant park in Billericay called Lake Meadows. As can be seen from the first picture, despite its great height it looks as though the Giant Redwood has had a mild encounter with a lightning strike - leaving it healthy, if a little flat-topped! 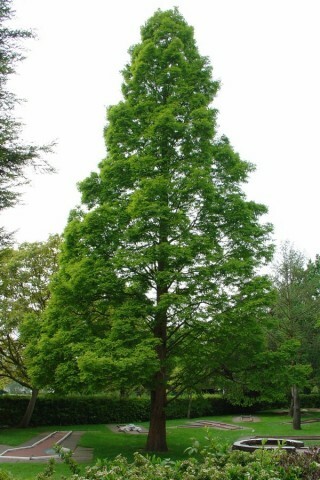 The Dawn Redwood sits in the midle of the Crazy Golf area. 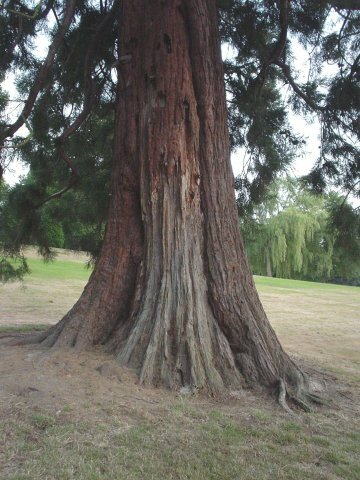 One of the noticable features of the Dawn Redwood (Metasequoia glyptostroboides) is the incredibly straight trunk, clearly visible in this fine specimen. You may also notice the classic neat cone shape that these lovely trees form. For difference between in the types of Redwoods see our Redwood Types page. There is a lake in the park (as the name suggests), a large children's playground and a tea-room - a pleasant spot to enjoy a cup of tea and a slice of cake, sitting outside on a warm day.